Books and manuscripts increasingly are distributed by electronic means, but the concept of copyright protection still stands. It is the author's legal protection against theft of literary, musical, or artistic work. When your book is placed under contract with an established publisher, the U.S. copyright is legally assigned by the publisher. Note that this protects the author from misuse of the work within the U.S. It's not global protection. Every nation has its own laws regarding copyright within its own borders. In fact, your unpublished work is protected by U.S. copyright, which "protects an author's expression in literary, artistic, or musical form," no matter what its publication status is. If this isn't enough for your ​peace of mind, you may want to further protect your work. If you decide you want the extra assurance of proactively copyrighting your work, you can register a literary work online through the U. S. Electronic Copyright Office. One odd but true fact: Unlike a brand name, a book title cannot be protected by copyright. Email hacking is a familiar threat in today's world but this is probably near the bottom of most writers' lists of anxieties. The volume of unpublished manuscripts flying through cyberspace between writers, agents, editors, and self-publishers is very high. Anyone out to steal a runaway bestseller is looking for a needle in a thousand haystacks. That said, take sensible precautions. When sending manuscripts via email to anyone with whom you don't have a contract or agreement, send it in PDF form, not as a word-processed document. That at least makes it harder to alter or steal. If you are sending your unpublished book manuscript to a self-publishing service, make sure the company you're dealing with is reputable and that their manuscript submission method is secure. 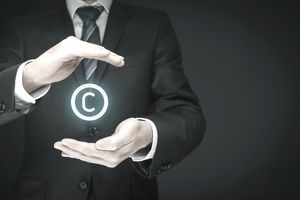 According to the U.S. copyright law, "Copyright protection is available for all unpublished works, regardless of the nationality or residence of the author." So, if you are sending your work to an American publisher, it will be protected by American copyright law. However, the law also states, "There is no such thing as an 'international copyright' that will automatically protect an author's writings throughout the entire world. Protection against unauthorized use in a particular country depends, basically, on the national laws of that country." Most nations that have copyright laws respect the copyrights of other nations, by formal treaty or just by good business practice. That is, if a copyrighted American novel reaches bestseller status, the author can expect publishers from other countries to show interest in acquiring rights to distribute it in their countries. When they do, the book will probably be copyrighted in those nations. The process protects the publisher as well as the author.